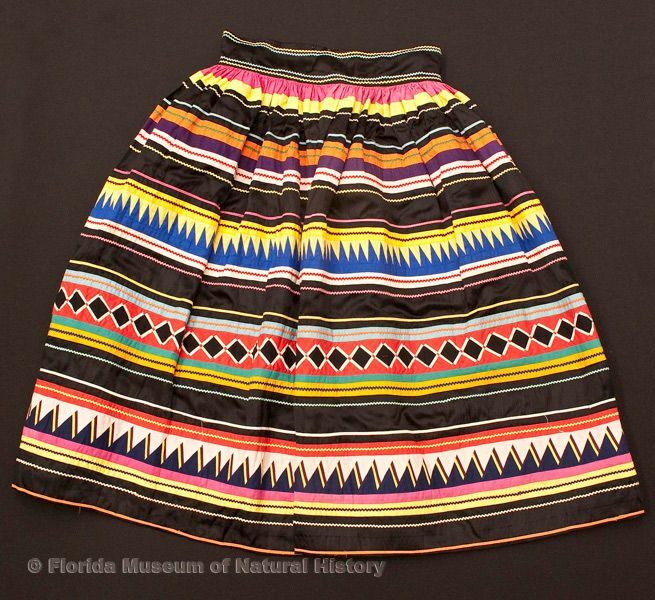 The Florida Ethnographic Collection at the Florida Museum of Natural History is one of the largest and most comprehensive collections of Florida Seminole and Miccosukee materials in the world. The faculty and staff of the Anthropology Division’s South Florida Archaeology and Ethnography Program, established in 1983, actively maintain the collection with assistance from graduate students, undergraduate students, volunteers, and interns. 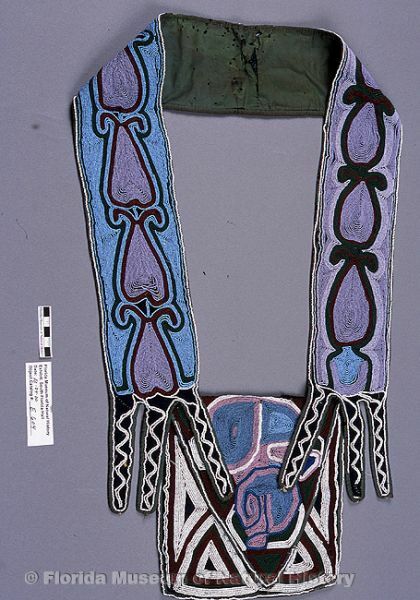 The collection is supported in part by the Anne D. Reynolds and Charles L. Reynolds Jr. Ethnographic Endowment. As of June 30, 2016, there were 978 individual catalog records in the FEC, accounting for 1154 total objects. Of these 1154 objects, 471 (41%) are media in the form of photographic prints, photographic slides, postcards, posters, glass plate negatives, audio recordings, books, newspaper articles, and an oil painting. Many of these items were collected systematically by John Goggin in the 1940s and 1950s, to be used as a research and teaching collection. Many of the other items have been donated by relatives of people who lived and worked among the Seminole and Miccosukee in the late 1800s and early 1900s. Recent substantial donations from Keith and Sara Reeves and from Anne and Charles Reynolds have further enhanced the collection. When compared to other museums nationally, the FEC ranks third in the number of individual Seminole or Miccosukee object records. Among the objects are bandolier bags, baskets, beadwork, dolls, moccasins, rattles, silverwork, tools, woodcrafts, and patchwork clothing. Some items from this collection are on exhibit in the Hall of South Florida People and Environments. 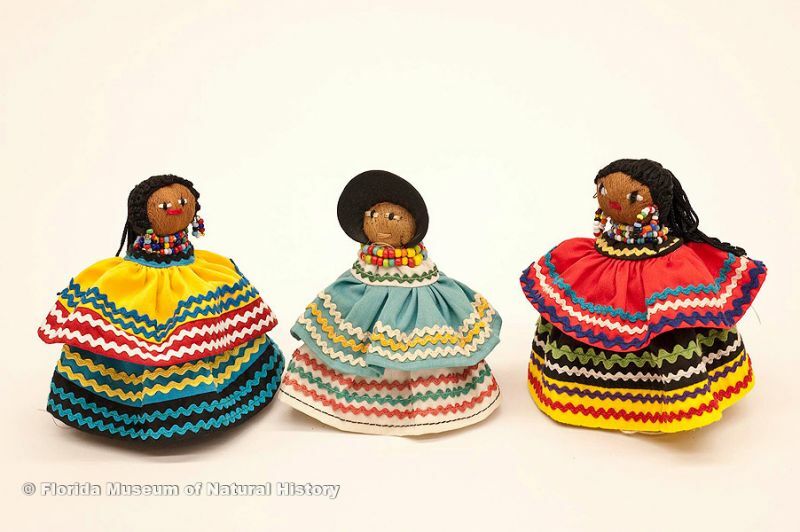 Dolls, female, Seminole, cotton cloth, glass beads, palm fiber: ca. 2000, 4.3” high (2006-20-19), ca. 1978, 4.5” high (E-663), and ca. 1982, 4.9” high (E-806). 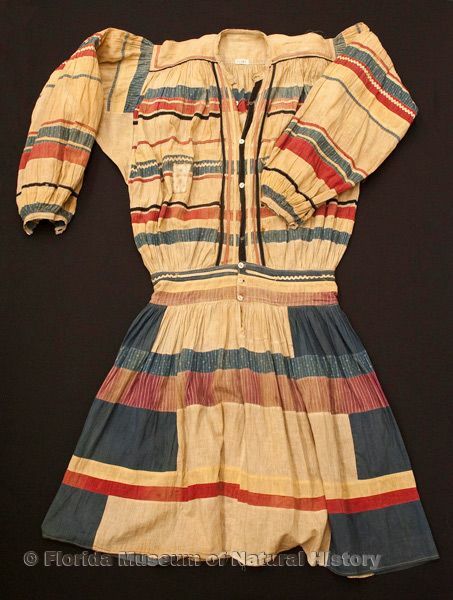 Man’s long shirt, cotton cloth and thread, early 20th century, 47.2” top to bottom (21387). Rattle, Seminole, box turtle shell (Terrapene carolina), wood, leather, 20th century, 13.3” long (E-882). 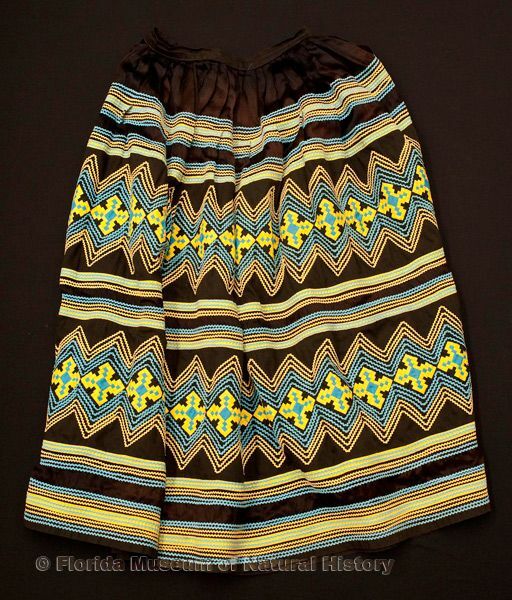 Woman’s skirt, Seminole, cotton cloth and thread, satin cloth, made by Dorothy Buster, 1970s, 35.5” top to bottom (2008-27-2). 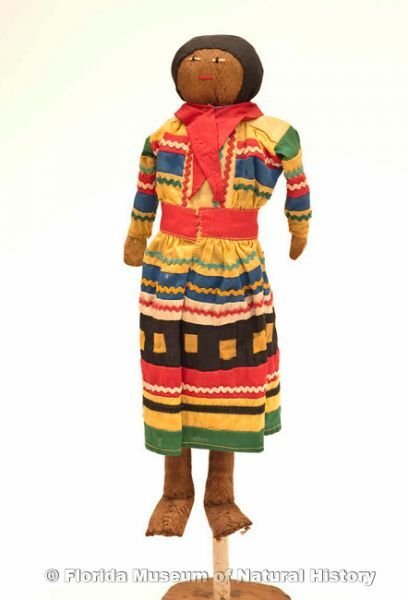 Doll, male, Seminole, cotton cloth, palm fiber, early 20th century, 12.8” high (2007-7-15). 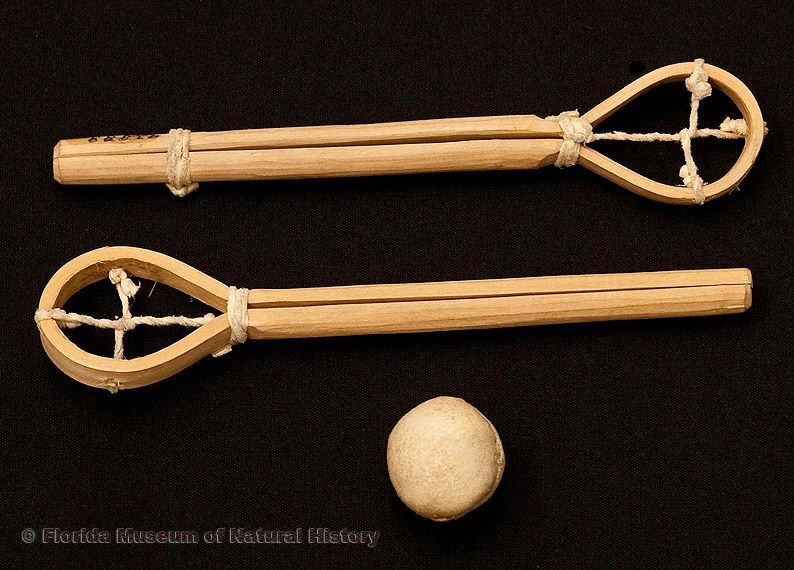 Miniature stickball racquets (pair) and ball, Seminole, cypress wood and buckskin, collected 1950 from William McKinley Osceola’s camp, sticks 6.9” long, ball 1.2” diameter (92888, 92887). 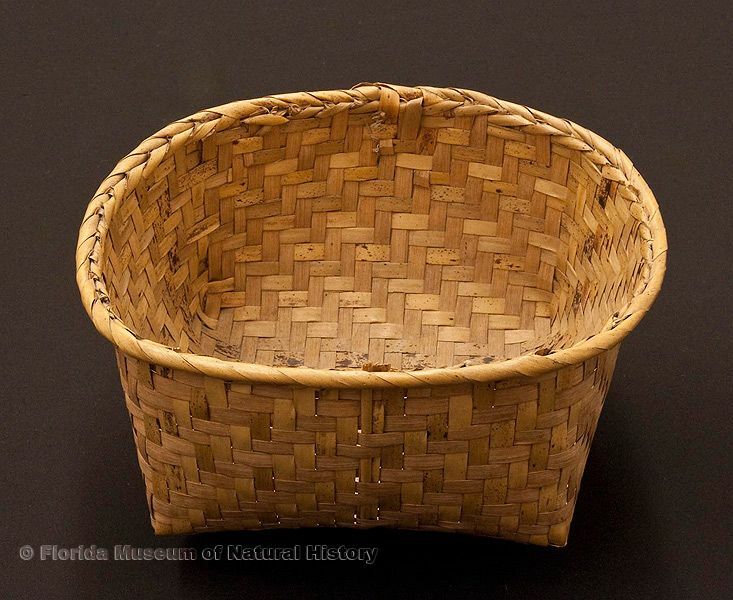 Basket, Miccosukee/Seminole, split saw palmetto stems, 1943, purchased at Musa Isle, 14.2” long (92922). Sash, fingerwoven, Seminole, wool yarn, glass beads, ca. 1830s-1840s, 4.0” wide at center (E-600). 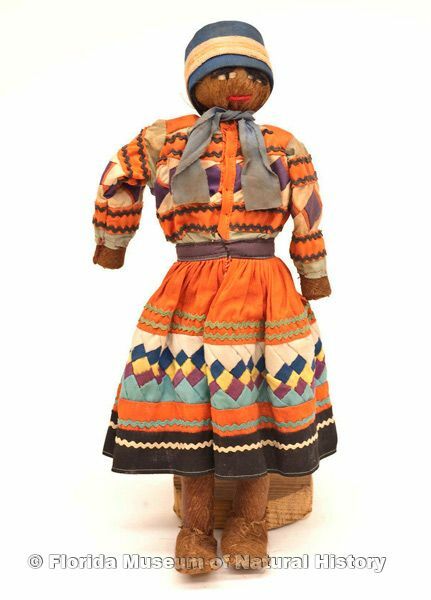 Doll, male, Seminole, cotton cloth, palm fiber, early 20th century, 12.0” high (2007-7-14). 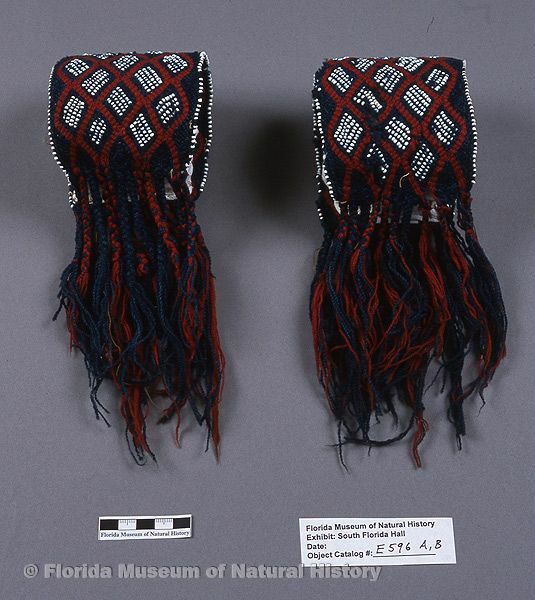 Bandolier bag, Seminole, cotton cloth, glass beads, ca. 1830s-1840s, 4.0” maximum width of band (E-603). 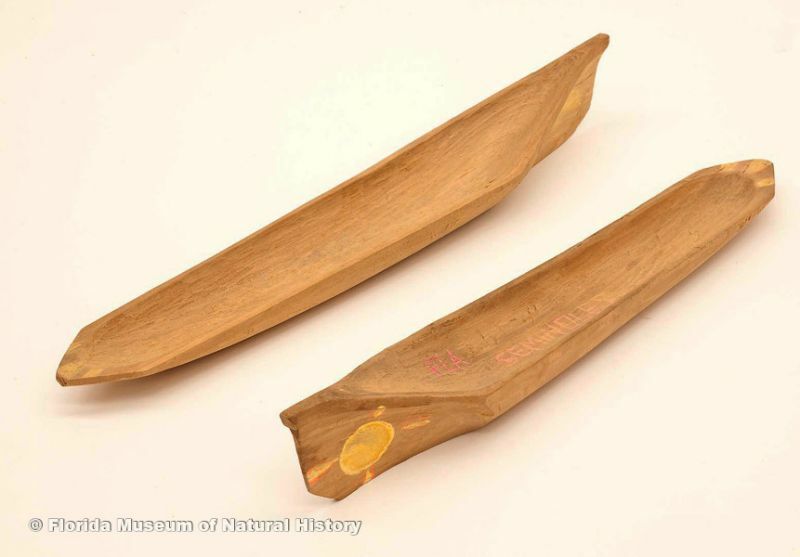 Miniature canoes: Seminole, wood, ca. 2000, 12.4” long (2007-7-17) and 11.8” long ( 2007-7-18). 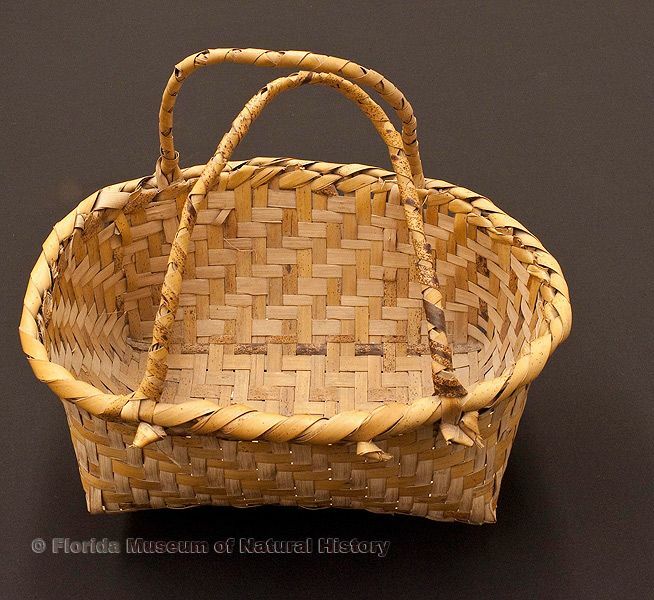 Basket, Miccosukee, split saw palmetto stems, purchased at Tamiami Trail in 1949, 8.0” long (92904). 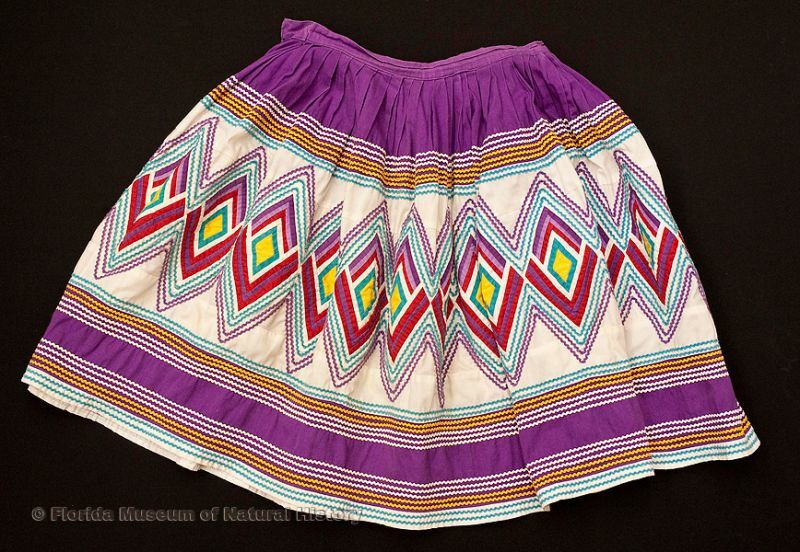 Woman’s skirt, Miccosukee, cotton cloth and thread, early 20th century, 30.7” top to bottom (87-1-1). 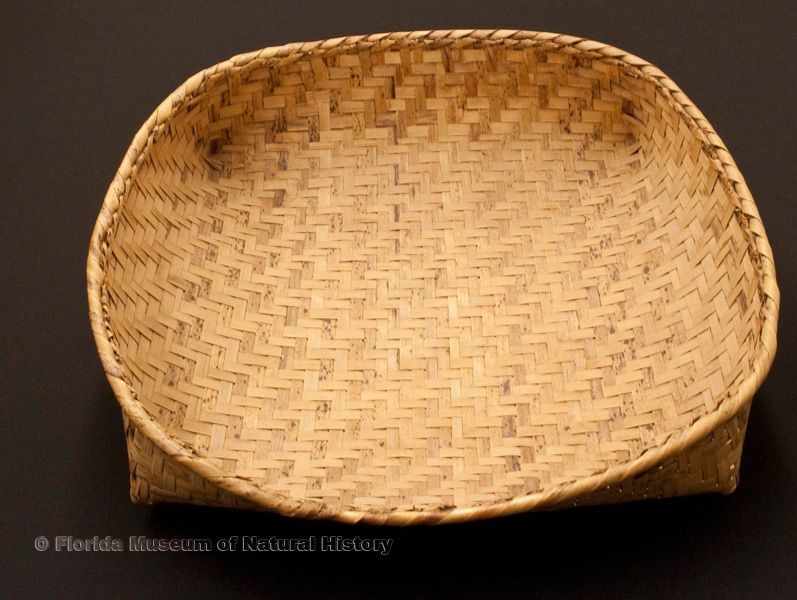 Basket tray, part of a set used for sifting, Miccosukee, split palmetto stems, made at Josie Billie’s camp, 1939, 13.8” long (92917). 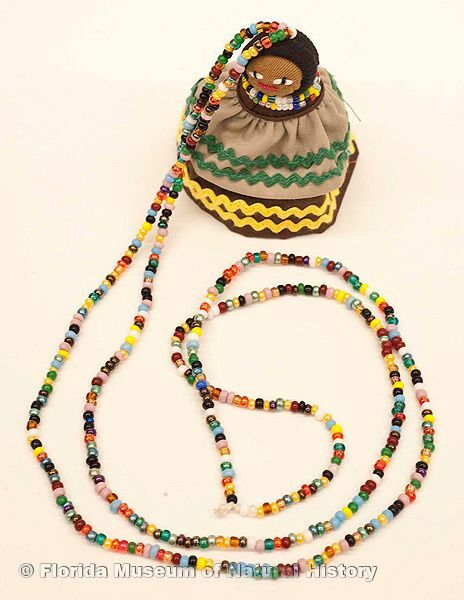 Doll, female, necklace, Seminole, cotton cloth, glass beads, palm fiber, ca. 2000, doll is 2.5” high (2006-20-8). 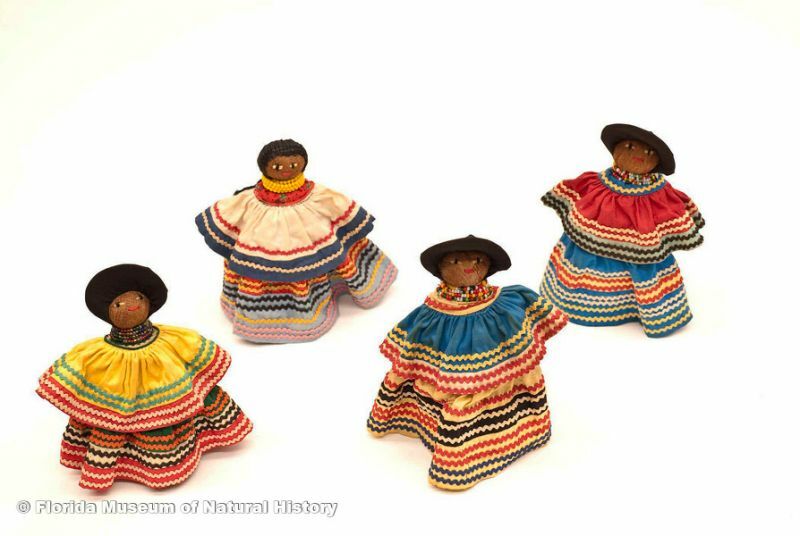 Dolls, female, Seminole, cotton cloth, glass beads, palm fiber, early 20th century, 8.3” high (88-6-4) and 7.3” high (88-6-6). 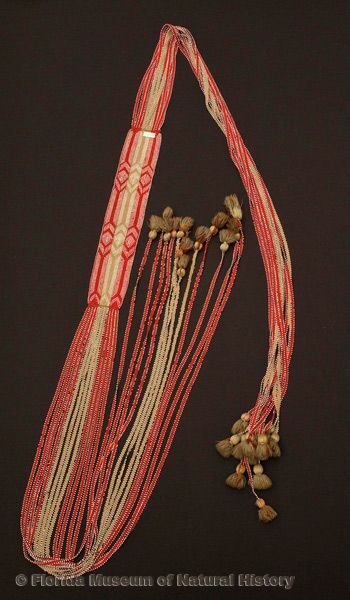 Sash, fingerwoven, Seminole, wool yarn, glass beads, ca. 1830s-1840s, 2.3” wide at center (E-602). 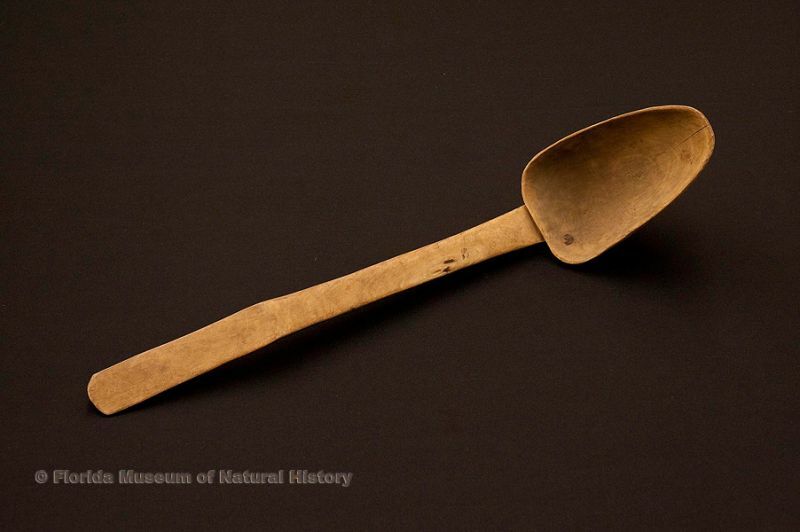 Sofkee spoon, Seminole, wood, late 19th century, 23.4” long (88-6-1). 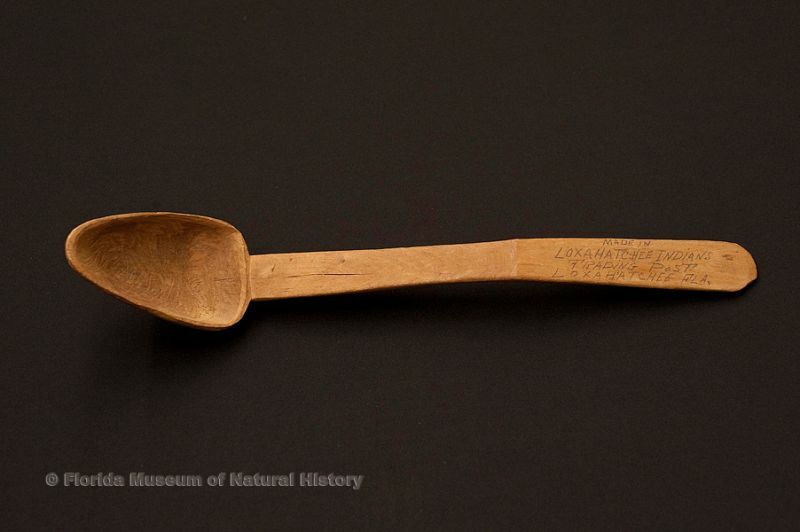 Sofkee spoon, Seminole, wood, made by Charley Cypress, Big Cypress Swamp, 1952, 19.7” long (92794). 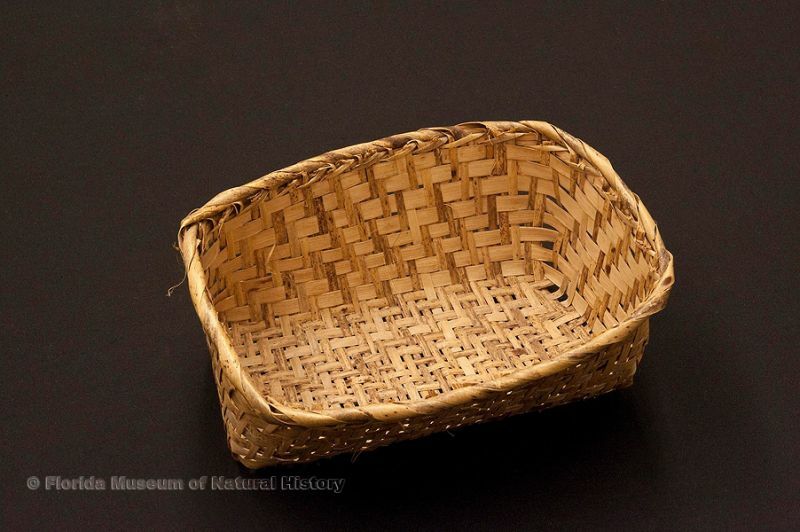 Basket, Seminole, split saw palmetto stems, 1943, purchased at Musa Isle, 7.5” long (92921). 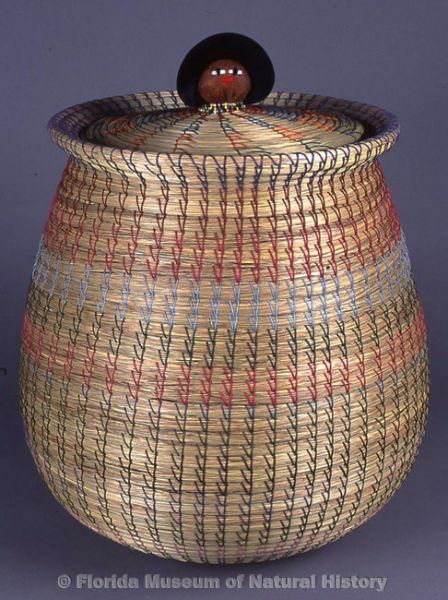 Basket, Seminole, sweetgrass, cotton thread, palmetto fiber, early 2000s, 6.9” long (2006-20-1). Man’s long shirt, cotton cloth and thread, made at Tamiami Trail, 1950, 49.2” top to bottom (92782). Garters, fingerwoven, Seminole, wool yarn, glass beads, ca. 1830s-1840s, 8.3” long (E-596). 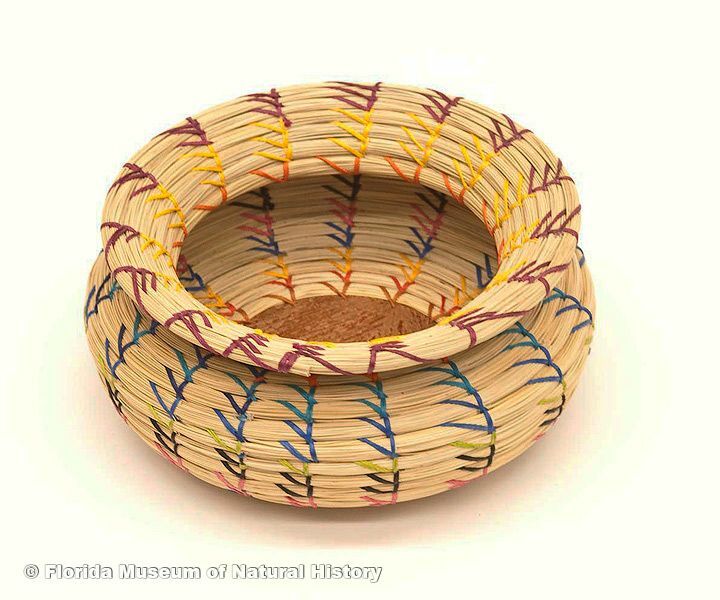 Basket, Seminole, sweetgrass, cotton thread, palmetto fiber, cotton cloth, glass beads, 1990s; made by Agnes Billie Cypress (basket) and Lucy Johns (lid), Immokalee, 20.0” high (97-8-1). 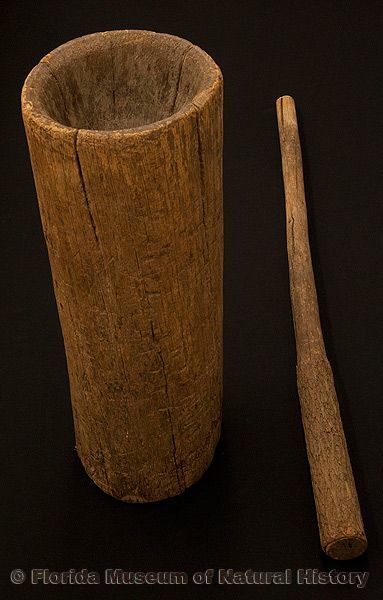 Mortar and pestle, Seminole, wood, early 20th century, near Moore Haven, 27.6” high (E-932). 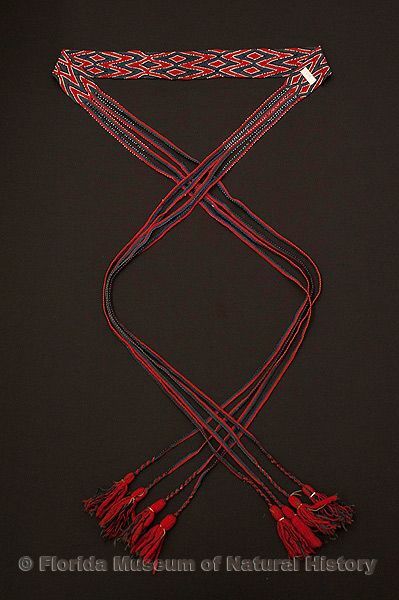 Bandolier bag, Seminole, wool yarn, wool, brass, glass beads, ca. 1830s-1840s, 25.0” long, 17.0” wide (E-598). 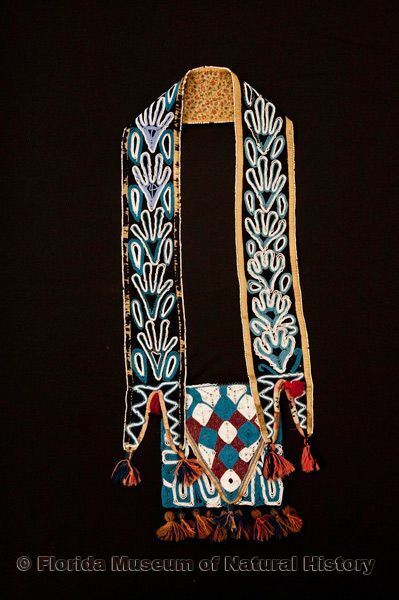 Bandolier bag, Seminole, cotton cloth, glass beads, 19th century, 25.0” long, 12” wide (E-604). 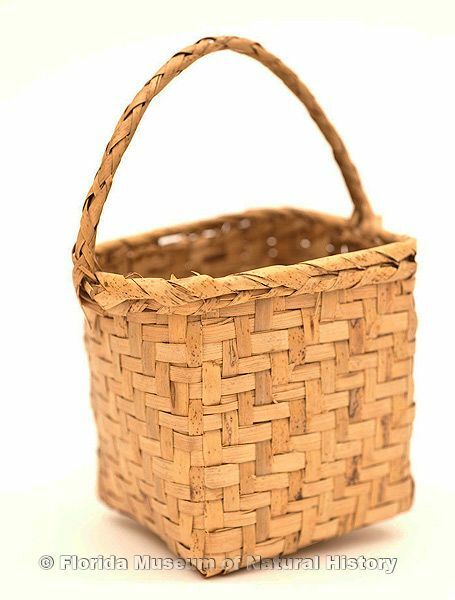 Basket, Seminole, split saw palmetto stems, purchased at Bert Lasher’s camp, Miami, 1943, 6.3” high (92919). 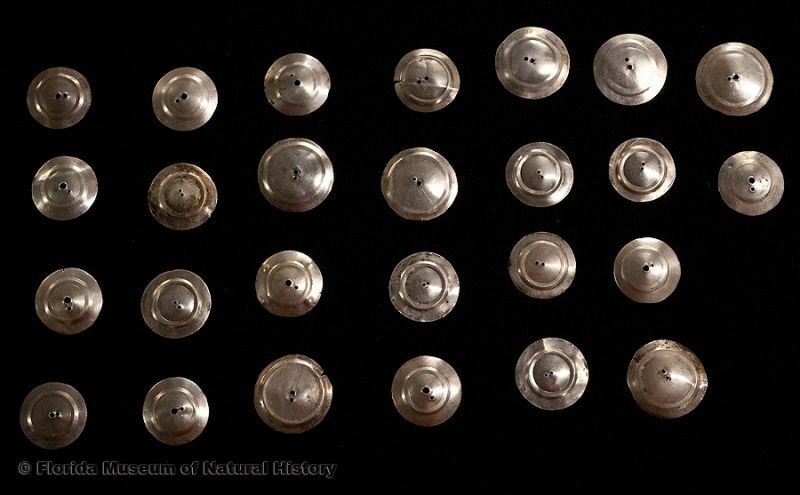 Male “Doctor’s” coat, Seminole, 1830s or 1840s, 45.1” top to bottom (E-595). 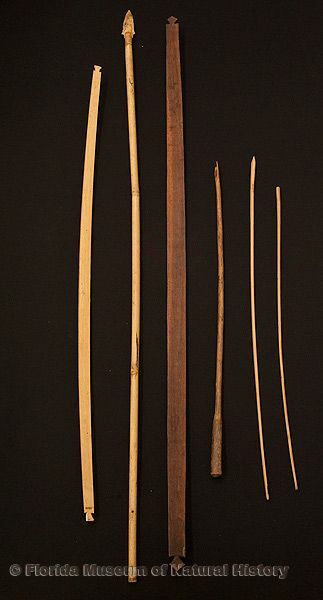 Bows and arrows: bow, Miccosukee, wood, made by Charley Cypress at Big Cypress Reservation, 1952, 47.6” long (92801); spear, Seminole, bamboo, twine, ca. 1926, 57.7” long (92-46-4); bow, Seminole, wood, ca. 1890s, purchased at Mr. Charlie Tiger Tail’s Trading Post, 58.3” long (E-789); arrow, unfinished, Miccosukee, wood, ca. 1950, 31.9” long (92803); arrow, Miccosukee, wood, ca. 1952, made by Charley Cypress, Big Cypress Reservation, 30.2” long (92806); arrow, Miccosukee, wood, ca. 1952, made by Charley Cypress, Big Cypress Reservation, 34.5” long (92802). 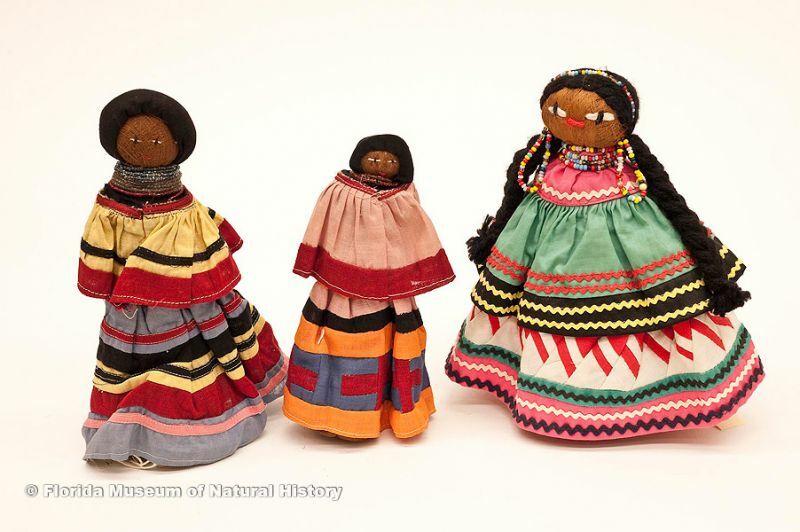 Dolls, female, Seminole, cotton cloth, glass beads, palm fiber, early 20th century, 6.7” high (2007-7-9), 6.6” high (2007-7-10), 7.7” high (2007-7-12), and 7.4” high (2007-7-11). 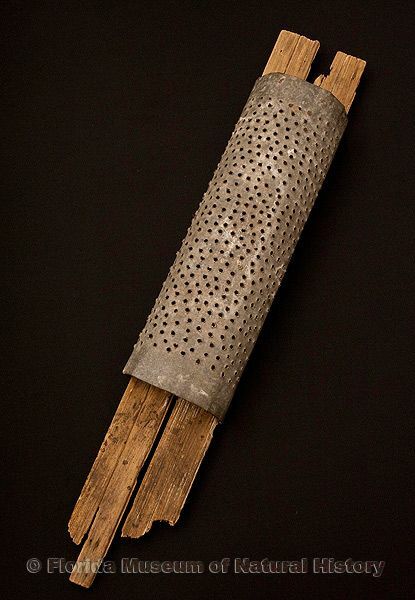 Coontie grater, Seminole, wood, perforated iron, glue, mid-20th century, west central Everglades, 44.0” long (93512). 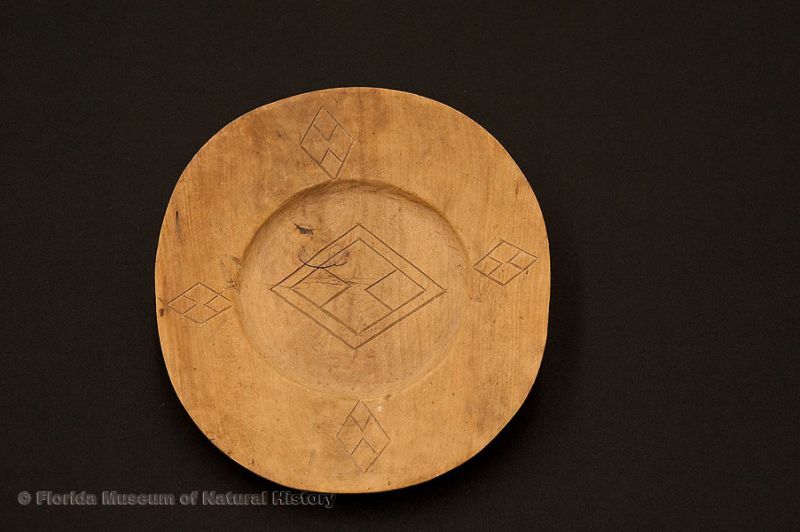 Plate, Miccosukee, wood, made in 1949 by The Frog (Miccohatchee) at Everglades City for Deaconess Bedell, 8.9” diameter (E-883). 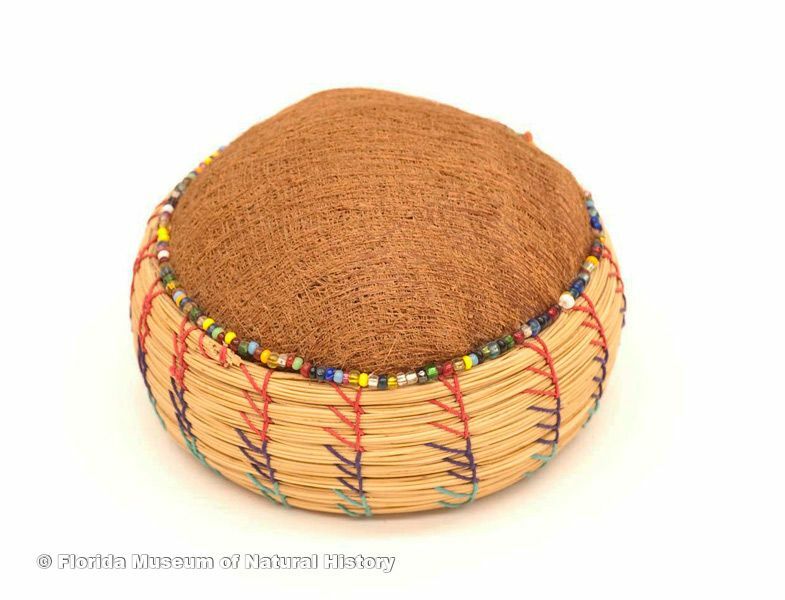 Basket pincushion, Seminole, sweetgrass, cotton thread, palmetto fiber, late 20th century, 3.9” diameter (87-46-6). 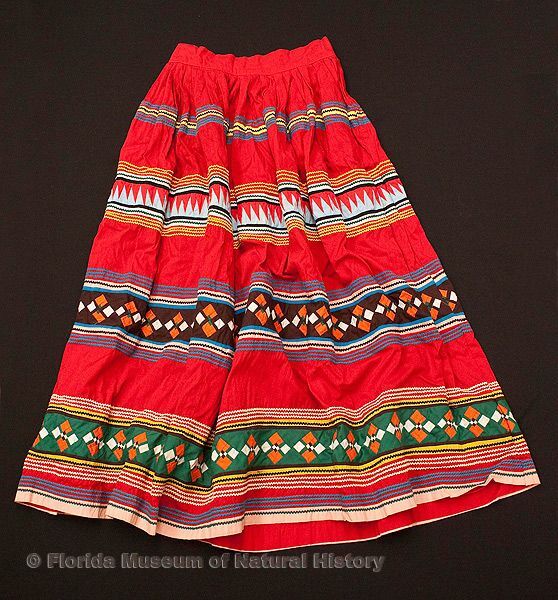 Woman’s skirt, Seminole, cotton cloth and thread, made by Ruby Clay (nee Billie), early 1960s, 35.0” top to bottom (E-699). 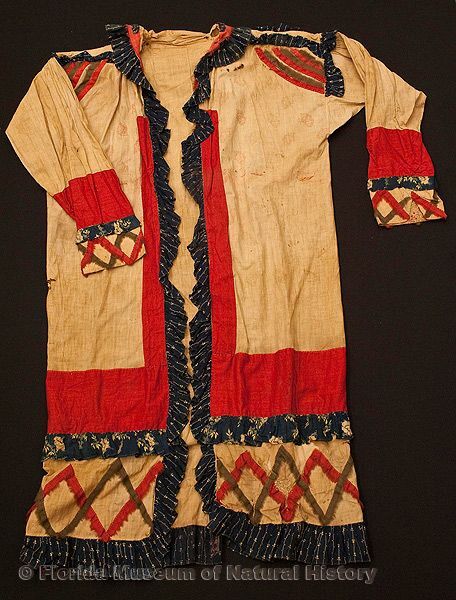 Man’s shirt, Seminole, cotton cloth and thread, ca. 1930-1950, 21.0” top to bottom (E-982). 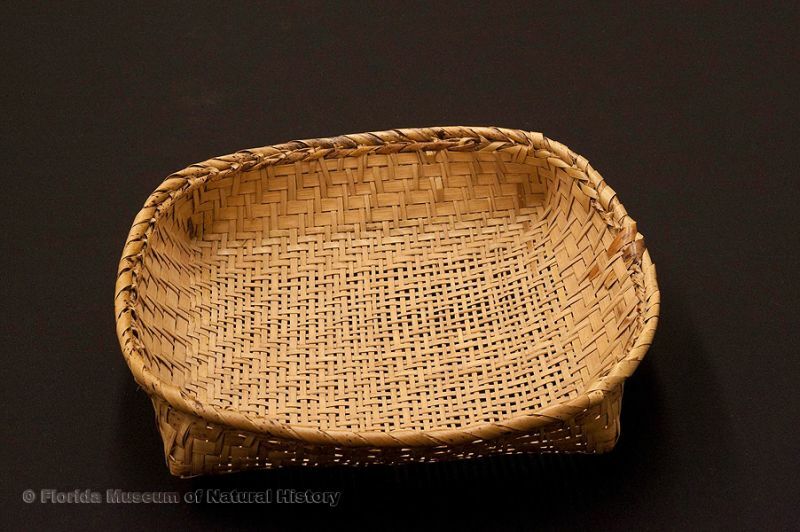 Basket sieve, part of a set used for sifting, Miccosukee, split palmetto stems, made at Josie Billie’s camp, 1939, 11.4” long (92907). 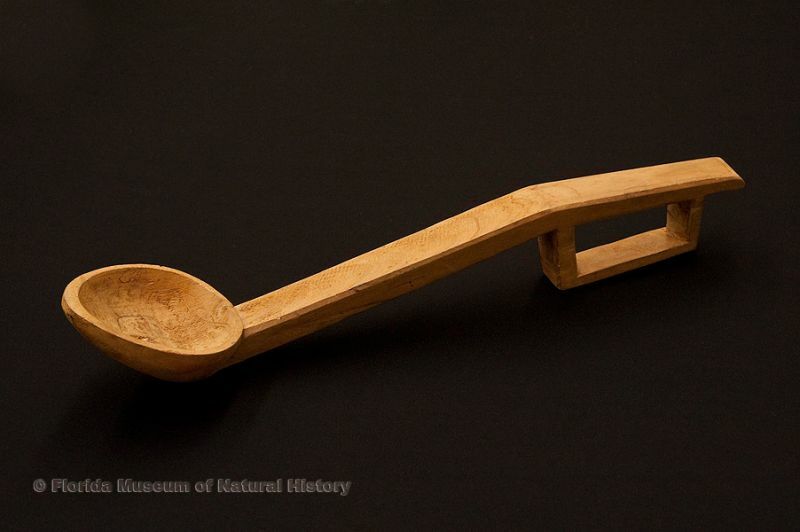 Sofkee spoon, Seminole, wood, early 20th century, 16.9” long (E-989). 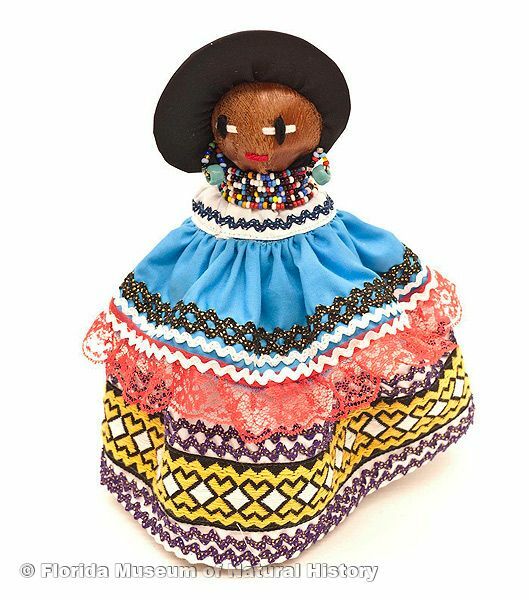 Doll, female, Seminole, cotton cloth, glass beads, palm fiber, ca. 2000, 9.8” high (2006-20-20). Silver bangles, Seminole, mid-20th century. 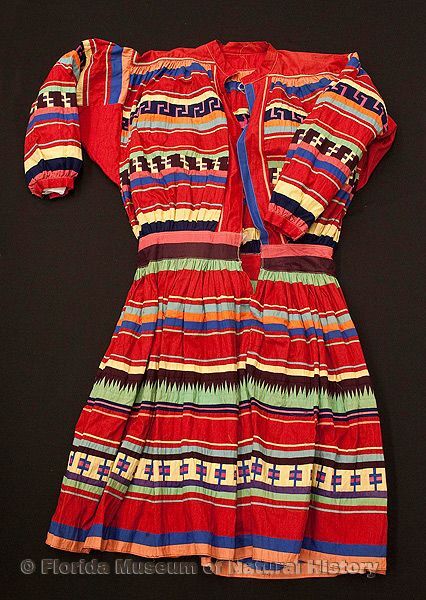 Woman’s skirt, Seminole, cotton cloth and thread, 20th century, 37.8” top to bottom (2007-7-3). 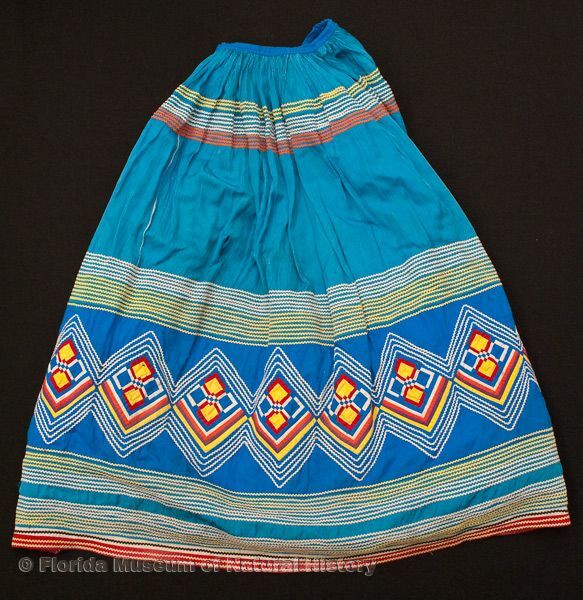 Woman’s skirt, Seminole, cotton cloth and thread, mid-20th century, 41.3” top to bottom (2008-27-1). 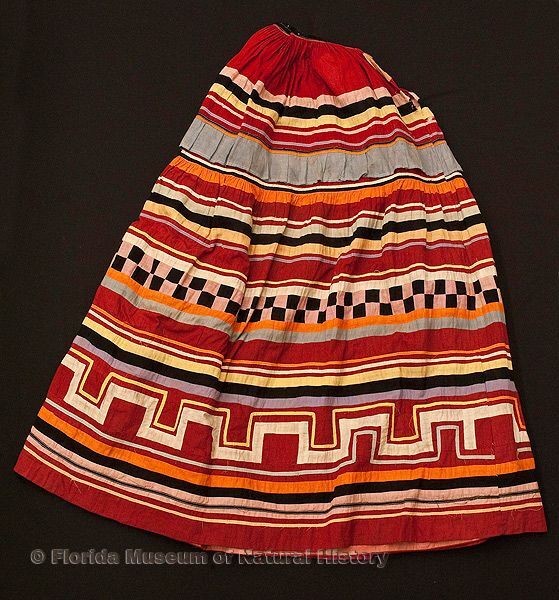 Woman’s skirt, Seminole, cotton cloth and thread, early 20th century, 36.0” top to bottom (98-7-2). 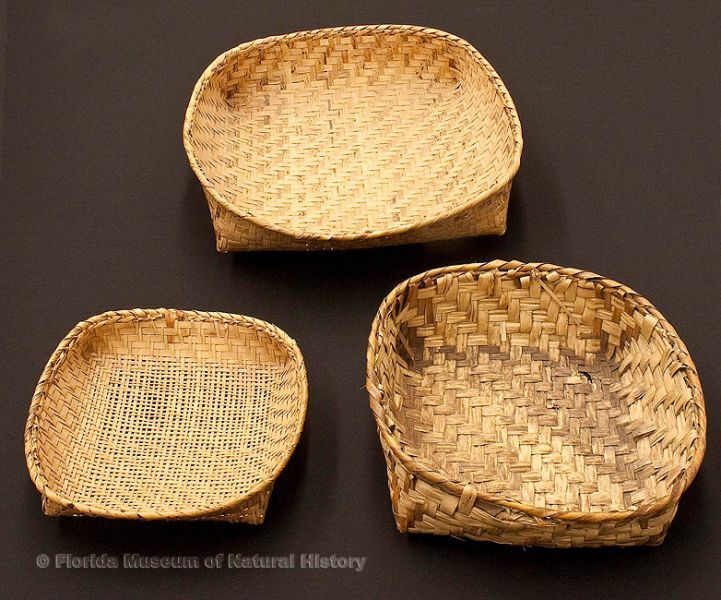 Three baskets, Miccosukee/Seminole, split palmetto stems, upper: basket tray, 1939, 13.8” long (92917); lower left: basket sieve, 1939, 11.4” long (92907), lower right: basket tray, early 20th century, 13.7” long (92903).